We rode past some diggers and tractors working on what looks like a softball field. Kade, who was riding in the trailer, was thrilled to see the machinery. We also rode around the stadium. It was so quiet there. No need to do any celebrating I guess. I didn't go too far onto campus because I wanted to avoid all the student traffic. 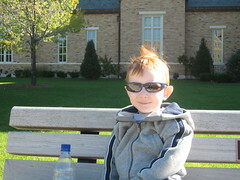 We did take a little break, Kade wanted out, by the Jordan Science building and the Athletic Complex. 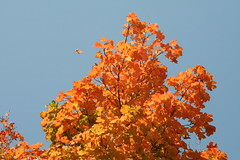 I'm going to have to make sure I get out enough to enjoy the rest of this beautiful Autumn. I'm sure I'll be raking soon enough. Maybe we can go to the pumpkin patch on Saturday. Hint, hint.